This is a concept for a coaster that has fascinated me for years. 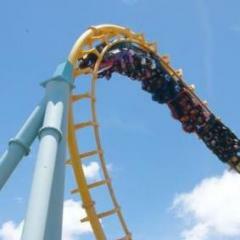 For those who don't know, in the early 90s Arrow Dynamics created a prototype of a new coaster design dubbed the Pipeline Coaster. The whole premise of the design was that the train was positioned in between the rails rather than above them. This design gave the benefit of performing manuevers such as perfect heartline rolls and was the main selling point for the ride. The design was plagued with problems though, mainly due to the train being ridiculously heavy which caused severe strain on the wheel assembly. Apart from the prototype that was at Arrow's HQ in Utah, the ride was never made, although apparantly one was partially built at Alton Towers before it was scrapped in favour of building Nemesis (this was the ill-fated Secret Weapon 1 and 2). Despite this, the Pipeline Coaster design is available in RCT3 and features the perfect heartline rolls that it was designed to do. I bring this up because I would personally love to see one of the big coaster manufacturers today tackle this ride design again. Ride technology and technology in general has come a long way since then and we're able to make rides lighter, smoother, safer and more comfortable than before. Right now one of the big trends in coasters is the Wing-Rider train designs found on 4D Coasters, B&M Wing-Riders and the current one-off Furius Baco. The concept for them is similiar to the Pipeline in regards to positioning the riders in line with the rails but are instead outside of the track instead of inside. I think the Pipeline concept would be a nice contrast to the Wing Rider design and provide its own kind of fun experience. Thoughts? Togo have made some similar coasters called the Ultra Twister. It's the smoothest togos you will ever ride. I'm not sure if it's still being sold but Scream Machines (similar simulation to No Limits) had this available as a track type. The train sat within the depth of the track. Very fascinating indeed, shame a model wasn't built! I remember seeing this on TPR a while ago, it's a really cool idea IMO too bad it never got made. I think the reason why Alton never built their pipeline was that Wardley thought the ride was too boring after riding the prototype, and ended up sticking with a B&M invert (Nemesis today). The thing is that modern coasters are designed around the heart line anyway. There's no need to place you between the rails because the track curls around you creating the same effect. it's interesting as a curiosity to see a different approach to making a smooth coaster, but really the superior design won out. The sensation is exactly the same because modern engineering/computing make it possible to provide the same heart line sensation, without the difficulty of putting the car between the rails. In the end Togo worked this out anyway by just having normal coaster track running through hoops. Yeah I remember seeing pictures of Viper way back in the day before it got demolished and thought the idea of going through the rings was awesome. Togo's Heartline Coaster I don't think is a worthy comparison because it was limited to travelling in a straight line and relied on switchbacks in order to make a complete circuit. The closest thing that was ever made was the Spiral Coaster built by Intamin. It was originally in South Korea but was relocated to Kuwait and has been SBNO since 2005. Coasters seem to be trending in exactly the opposite way -- see inverted, floorless, flying and most recently wing coasters. It's apparent that the demand is for less -- not more -- connection between riders and track. Arrow's pipeline coaster was the product of a company that was fast losing ground to newer, more innovative European concepts. When you look back at it now I think it's pretty clear that the same maneuvers and much, much more can be done with a much more simplistic track and train design. The novelty of being trapped in a cage or surrounded by track to me wouldn't be worth the severe limitations the pipeline design presents. It's apparent that the demand is for less -- not more -- connection between riders and track. Movie World has been working on that.